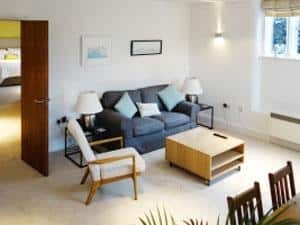 Tredennyke House, Barbourne Terrace, is a tastefully decorated, fully-serviced, secure, one-bedroom apartment, with gated parking and entry system with easy access to city centre, M5. Free WI-FI. Tredennyke House, Barbourne Terrace, a fully-serviced, secure, one-bedroom apartment, with gated parking and entry system. 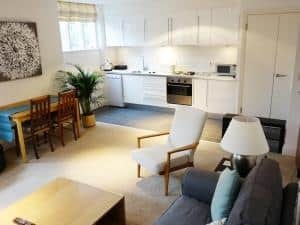 The apartment is ideally suited to the discerning traveller who requires anything from an overnight stay, weekend away, during a local festival or even a home from home during relocation. We can provide all the facilities of a hotel without the formality; a more relaxed and spacious place to stay is the result when you have to be away from home. Worcester Business Parks are very accessible together with Worcester Cathedral, the University of Worcester, the Law Courts and the many businesses which are located in the surrounding areas. Visitors to the historic City of Worcester wishing to discover the many attractions of the area and its environs will enjoy the high standards and thoughtful service of this apartment and the very competitive prices. The city of Worcester, county town of Worcestershire, is an ancient city with a modern outlook and one of the UK’s less explored historic cities, and it has great things to offer all types of visitor.